"Pretty Little Liars" star Troian Bellisario sure knows how to live life. Not only is she recently engaged and starring on ABC Family's biggest hit series, but she also gets to hang out with her fiance Patrick J. Adams in Paris! The "Suits" actor, 32, is currently in the City of Love for eight weeks filming the television miniseries remake of "Rosemary's Baby." When Troian, 28, heard the news of his casting, she took to Instagram to share her travel plans. 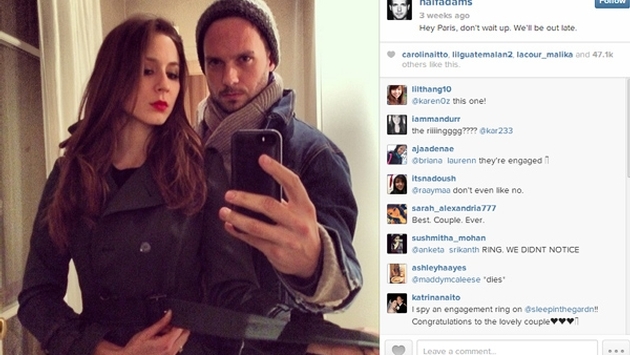 Troian and Patrick are now hanging in the French capital, as evidenced by her Instagram account. "Paris sky," she caption the photo below on March 4. She later claimed that "Paris is for lovers," which we wholeheartedly agree with. Us Weekly reports that Patrick's proposal took place in January, noting that Troian had "been hiding her ring in the press." Nevertheless, we hope to get some more photos of these lovebirds perusing around Paris.